In case you were too busy enjoying (or hating on?) Transformers: The Last Knight, you should know that crude oil prices from both London and New York officially hit bear market status last week. 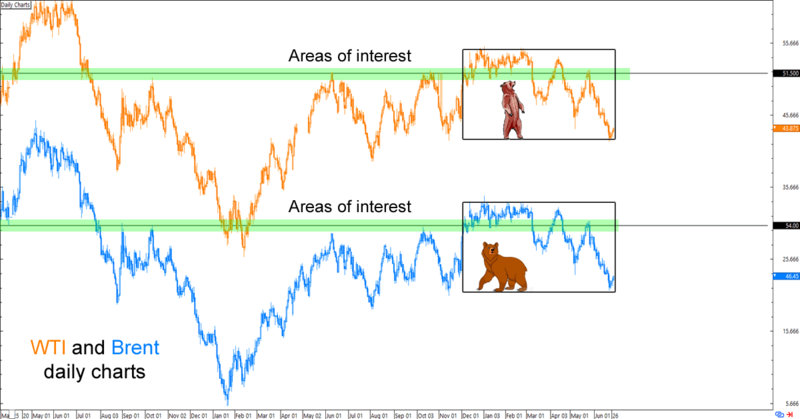 For trading newbies out there, know market players usually define “bear market” as a condition where an asset’s price falls by at least 20% from its peak in multiple indices. And last week, a U.S. oil production report dragged the West Texas Intermediate (WTI) crude oil prices down 2.3% to $42.53 while Brent crude oil sustained a 2.6% loss to $44.82. Since prices were trading at around $54 and $57 as early as February, last week’s drop officially put the Black Crack in bear market territory. Yikes! Remember that OPEC and non-OPEC members recently decided to extend their oil production cut deal in an effort to rebalance the global oil glut. Unfortunately, oil players weren’t impressed, as they believe that the group’s influence on global oil prices is losing its mojo. And if that’s not bad enough, recent geopolitical developments in the region have piled up against the OPEC’s favor. First up is Saudi Arabia and gang trying to strong-arm convince Qatar to turn its back on not-so-secret BFF Iran. While tensions in the oil-rich region would normally boost prices higher, oil traders are more worried that Qatar – which has signed the OPEC deal – will say “Bye, Felicia!” to the deal and undermine OPEC’s efforts. Even those who are exempted from the OPEC deal are also causing bearish pressure on oil prices. See, Libya’s state oil firm just reached an agreement with Germany’s Wintershall AG. The move is expected to undo some of the 160,000 barrels per day (bpd) lost since the start of the dispute. Heck, Libya’s oil production has already risen by more than 50,000 bpd since the deal! Iran, which is allowed to produce 3.8 million bpd per the OPEC deal, also saw its oil exports to the West rise to its highest level since sanctions were lifted in early 2016. Meanwhile, Nigeria’s output has recovered to its highest levels in more than a year as it reopens a major oil terminal. Last but not the least is the promotion of Mohammed bin Salman as Crown Prince status in Saudi Arabia. Mohammed’s new position is a BFD because, in his “grand vision” revealed early last week, the heir-apparent shared his plans to steer Saudi Arabia away from its “oil addiction” by privatizing sectors and injecting money into public investments. For some analysts, Mohammed’s new direction (no, not the band. That’s One Direction) could mean less focus on rebalancing the oil markets. While OPEC members and their allies are busy hacking at their production, Uncle Sam is busy getting efficient and reaping the benefits of higher oil prices. Last Friday’s U.S. oil and gas rig count by Baker Hughes showed that the U.S. drillers have added another 11 oil rigs last week. This brings the total to 758, the highest since April 2015 and marks the 23rd consecutive week of increased oil rigs. For reference, there were only 421 active rigs for both oil and natural gas last year. Meanwhile, a report from the U.S. Energy Information Administration (EIA) showed that while the new OPEC deal would cause inventory draws in Q2 and Q3 2017, the resulting higher prices will eventually attract U.S. oil producers who are more responsive to oil price changes. 3. Profit-taking from speculative positions? If you look at WTI and Brent’s daily charts, you’ll see that oil bears had huge incentive to start pouncing when WTI and Brent consolidated and then eventually broke the $51.50 and $54.00 psychological levels respectively. Meanwhile, other analysts are pointing out that long-term speculators might have simply started selling their long bets after OPEC’s much awaited production cut deal (and its extension) failed to revive oil prices earlier this year. Further unwinding from speculators could break an “uptrend” in the CFTC’s net speculative positions, which is uncomfortably similar to 2014’s selloff when a “breakout” heralded a drop to sub $50 levels by early 2015. Does this mean that oil prices will continue to drop? Not necessarily. Though optimism for oil prices remains murky, the selloff for the past couple of days has also taken the edge off from its overbought conditions. All eyes will be on the U.S. EIA crude oil inventories report published tomorrow at 2:30 pm GMT. Market players are expecting a draw of 2.1 million barrels from last week, so anything significantly lower could trigger another round of selloff for oil prices. On the other hand, a new trading quarter around the corner and the recent selloff in oil prices will likely attract a couple of bulls at the earliest sign of bullish news. But unless we see significant improvements in oil’s supply outlook, then this won’t be the last time that we’ll talk about oil sliding into bear market territory.